The guy likes his fans. Takeshi Kaneshiro‘s portrayal of the epic military strategist Zhuge Liang has forever redefined my definition of feathery fans. These fans do not say: prissy and finicky–well, in the past, they did. Nowadays, they translate to resourcefulness, stratagem and guile. 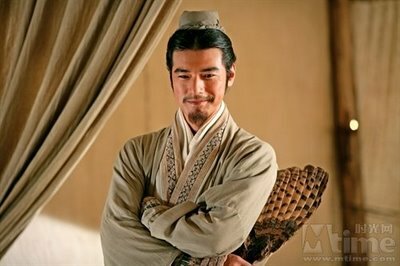 Despite Zhuge Liang / Takeshi Kaneshiro being a sight for sore-eyes, (there, I said it–but you were thinking it, weren’t you?) one must admit that behind that amiable facade lay an even more admirable brain. Unfortunately, he is no longer alive and I can no longer pick through his brains. I will have to content myself with his body of works; the wonder that is the internet has allowed for a break in the time-space continuum. I came across his 15 testaments for Military Leaders, they’re quite practical and applicable in and out of battle grounds. I will leave you with these 15, now let me get back to drawing Labaw Donggon, Humadapnon and Dumalapdap. More updates on the drawings tomorrow. 1. Gathering Intelligence–Use spies to collect information. 2. Information–Gather information about your enemy from various sources. 3. Bravery–Do not show fear against even the toughest foe. 4. Selflessness–Do not be moved by profit. 5. Equality–Award and punish all equally. 7. Compassion–Be willing to forgive. 9. Respect–Recruit those who have greater skills than yourself. 10. Wisdom–Do not listen to ill-will. 12. Lovingkindness–Treat your subjects with lovingkindness. 13. Loyalty–Sacrifice yourself for the good of the country. 14. Discrimination–Discriminate between what is possible and impossible. 15. Strategy–Know yourself and your enemy.